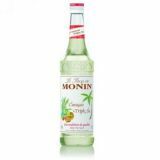 Monin Blue Curacao syrup in stylish 70cl glass bottle. Curacao is a liqueur flavoured with the dried peel of the green oranges originally from the West Indian island of Curacao, a tropical paradise, having beautiful secluded beaches that enjoy sunshine most days of the year. Initially discovered by accident, the drink was first developed and marketed by a Spanish family from Curacao in the 19th century. The liqueur has an orange flavour with varying degrees of bitterness. The most common blue Curacao is a stunning deep blue. Its non-alcoholic version Monin Blue Curacao is primarily used to induce colour into your drinks and brings a light exotic aroma. Blue-coloured orange-flavoured syrup is perfect to fancy your drinks! Colour: Deep blue even when it dilutes. Taste: Orange skin smell, candy bitter orange taste. Applications: Sodas, cocktails, fruit punches. Sugar, water, natural orange flavourings, colouring agent: E133.